Preheat the oven to 400° and position racks in the upper and lower thirds. Grease 22 madeleine molds and set on 2 large rimmed baking sheets. In a medium bowl, whisk the flour with the baking powder. In a food processor, pulse the granulated sugar with the black tea leaves and vanilla bean seeds until the tea leaves are finely chopped. Scrape into a large bowl and whisk in the eggs, honey and salt until smooth. Whisk in the dry ingredients until just combined. Stir in the milk and the 6 tablespoons of melted butter until incorporated. Spoon heaping tablespoons of the batter into the prepared madeleine molds, filling them three-quarters of the way to the top. Transfer to the refrigerator and chill until cold, about 20 minutes. Bake the madeleines for about 10 minutes, until the edges are golden brown and the cakes spring back when lightly pressed; rotate the baking sheets from front to back and top to bottom halfway through baking. Let cool slightly in the molds, then loosen with the tip of a small knife and transfer to a baking rack to cool completely. Dust with confectioners’ sugar before serving. 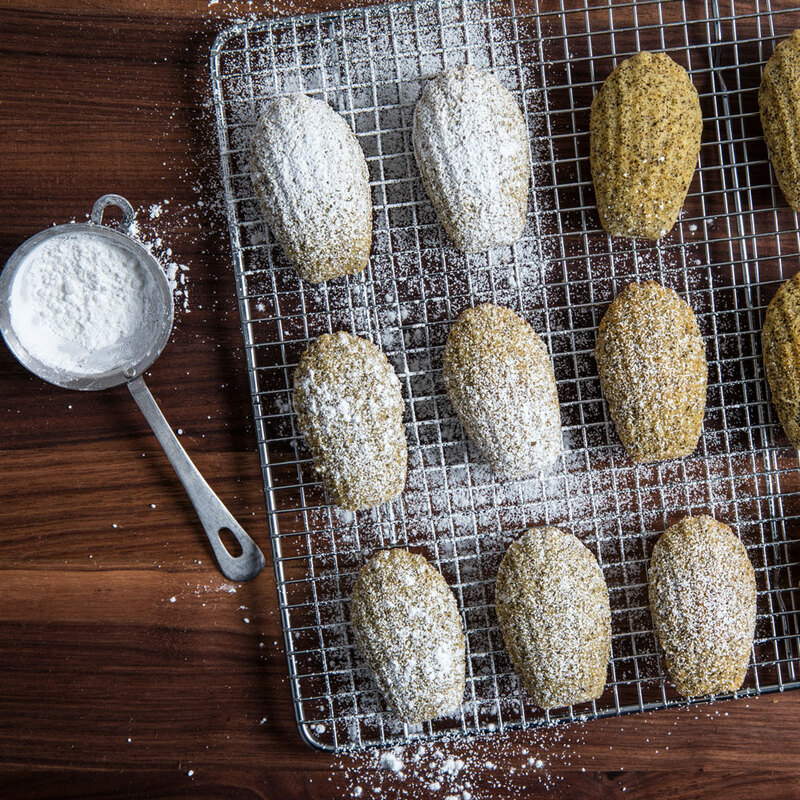 The madeleines can be stored in an airtight container at room temperature overnight.